Learn Card Weaving with Candace Crockett's Card Weaving! With nothing more than colored yarn and simple cardboard squares, you can produce exquisitely patterned woven bands! Travel the globe with a tour of card weaving history in Ancient Egypt, Scandinavia, Medieval Europe, Asia, and the Middle East, then come back to the present with an overview of card weaving today. You’ll be pleasantly surprised with the simplicity of materials required for card weaving: cards and yarn. This book contains templates to make your own cards out of poster board or cardboard. C-clamps and a small shuttle are also useful materials, but aren’t necessary for getting started. Begin card weaving with a sample band, and learn each step in the process with clear illustrations and diagrams. You’ll learn how to wind a warp, thread the cards, and weave the band. Plus, you’ll get tips for finishings, pattern variations, and correcting mistakes in your weaving. This section provides guidance for designing a band pattern, selecting colors, threading the cards, and creating pattern variations. Learn how to best utilize dark and light patterning in a variety of weave structures, including stripes, chevrons, double weave, and more! The finishing techniques with woven bands are limitless—this section provides instructions for twisted fringe, four-strand braiding, half-knots, square knots, tassels, and more techniques to successfully finish your weaving. This book also includes structural techniques, such as decreasing and increasing warp threads, using supplemental wefts, and tubular weaving. Plus, learn how to expand card weaving by introducing tension control, playing with warp twisting, and using cards in loom weaving. Card weaving opens up an abundance of new techniques to new and experienced weavers alike! 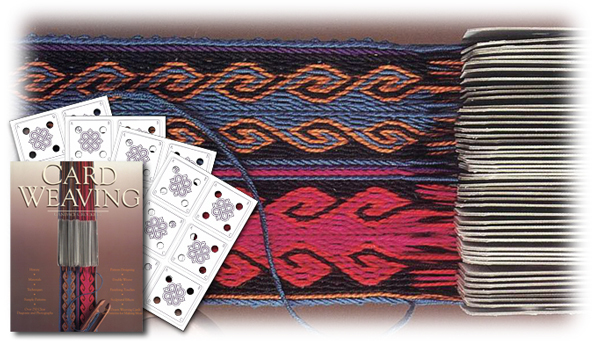 Get started card weaving today with this excellent resource!